Did you know that strep throat can spread through contact with droplets from the cough or sneeze of someone infected and is contagious for up to three days before diagnosis? The only way to diagnose strep throat is through a throat swab. Our pharmacies now offer rapid strep testing, making it more convenient for you to verify if you have strep throat. The test provides quick results and if positive, we dispense treatment and care instructions at the same time. There is no need to make an appointment and most pharmacies are open 7 days a week. No appointment or written prescription needed. 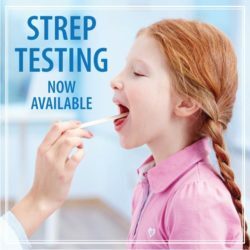 Our pharmacies now offer strep throat testing! If the results are positive, we will dispense the antibiotics and care instructions, all in one stop. It’s fast, convenient and easy. If you think it could be strep, stop by and see us today! Curious about what other services our pharmacy offers? Check them out here!